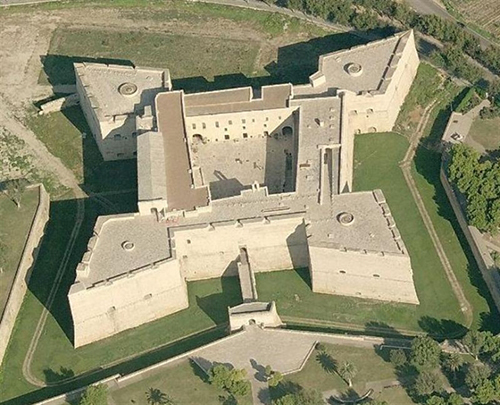 This is the architectural plan of the fortified castle of Barletta in Puglia. The castle dates back to Norman times, and Federico II occupied it 1225-28. 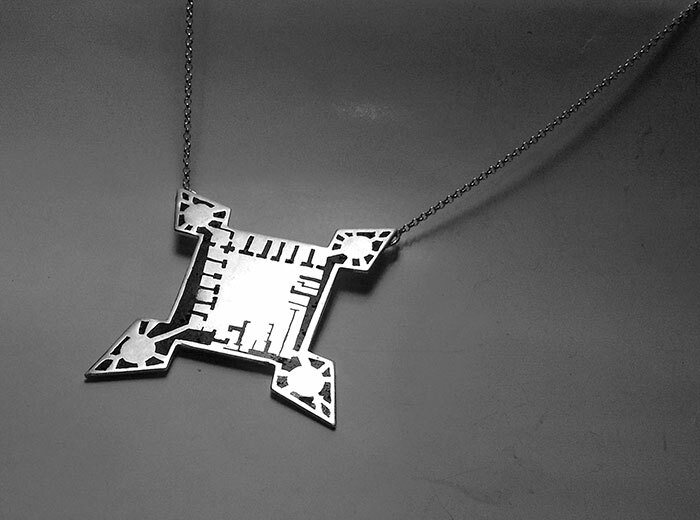 I wanted to use this plan to make pendants with a couple of different techniques. The first one utilizes crushed stone inlay and the second one encases the plan from a vintage Italian travel guide in resin and sulfured sterling silver. 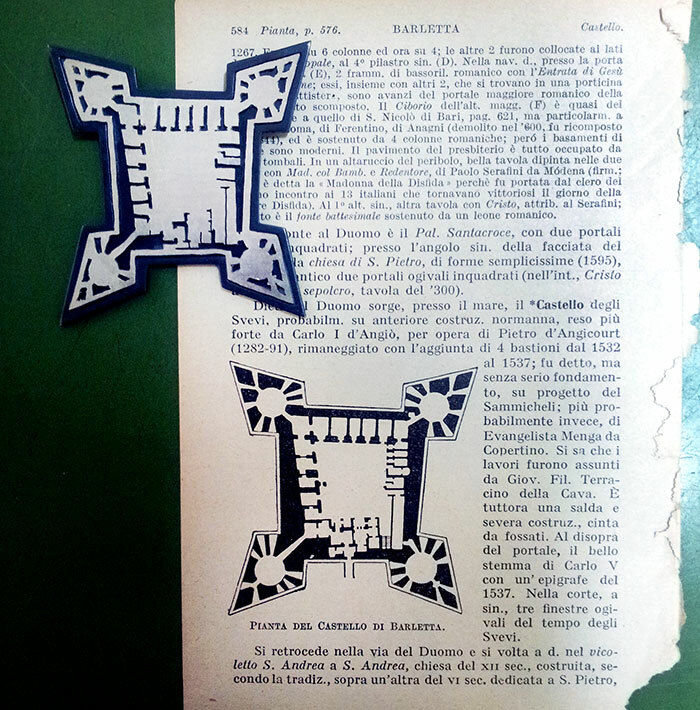 These are part of a series of ancient building plans in Italy: castles, churches, museums, and monuments. The process of crushed stone inlay is really quite easy and can be a great way to introduce color. I like to think of the end product as a simpler relative to traditional Florentine stone inlay or scagliola, but the process and product differs. Examples of stone that can be used are jet, coral, amber, lapis lazuli, turquoise, malachite, amethyst, and mother of pearl. Note: the stone color will appear darker and richer when process is completed. 3. mortar and pestle or other crushing tools, hammer, tweezers, etc. Crushed stone inlay can be used with different materials such as wood, but my preferred application is with sterling silver. The area that will be inlayed requires a frame around it. If using metal, the border can be as little as 1mm. 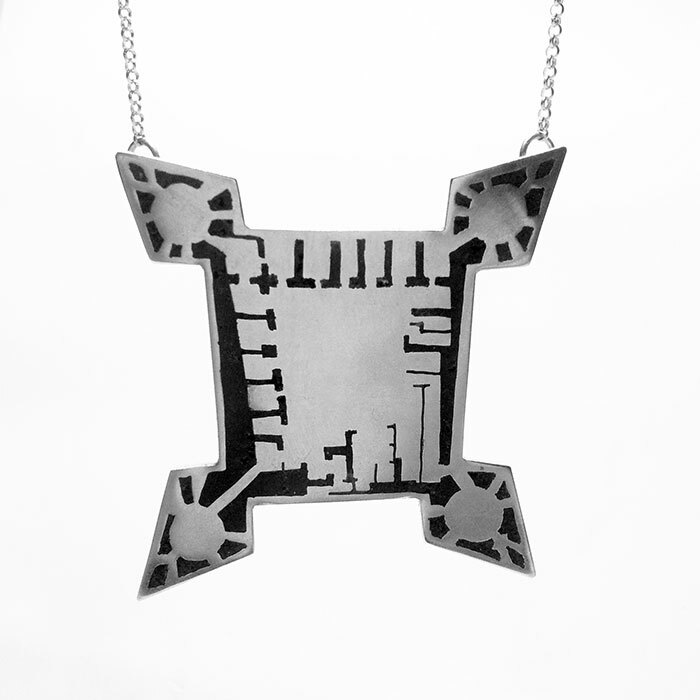 A design needs to be pierced, sawed, and filed cleanly in the piece of metal. 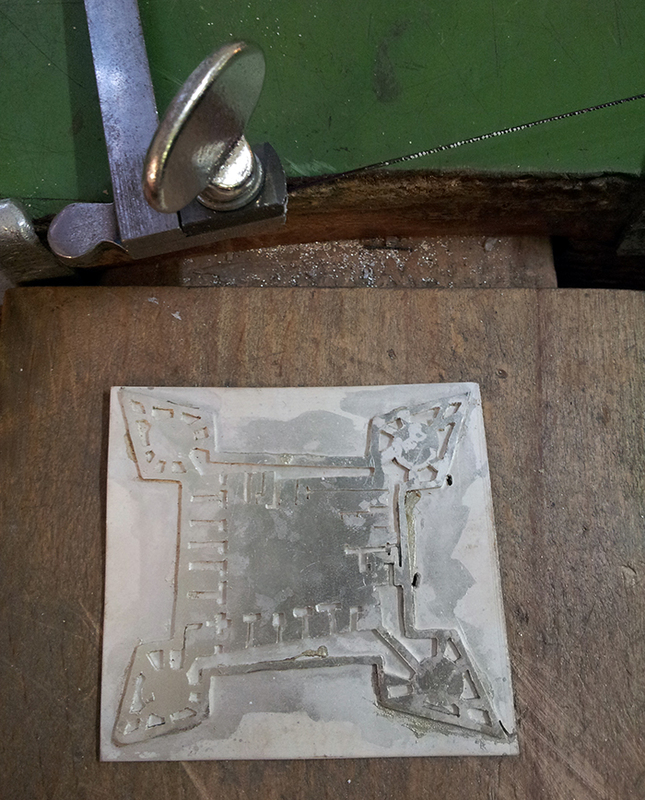 Alternatively, for a shape or stripe of stone inlay as in a ring, the border can be fabricated from sheet metal or wire rather than being pierced from sheet. The next step is to solder the frame or border to a backing piece of metal which should be slightly larger than the design. 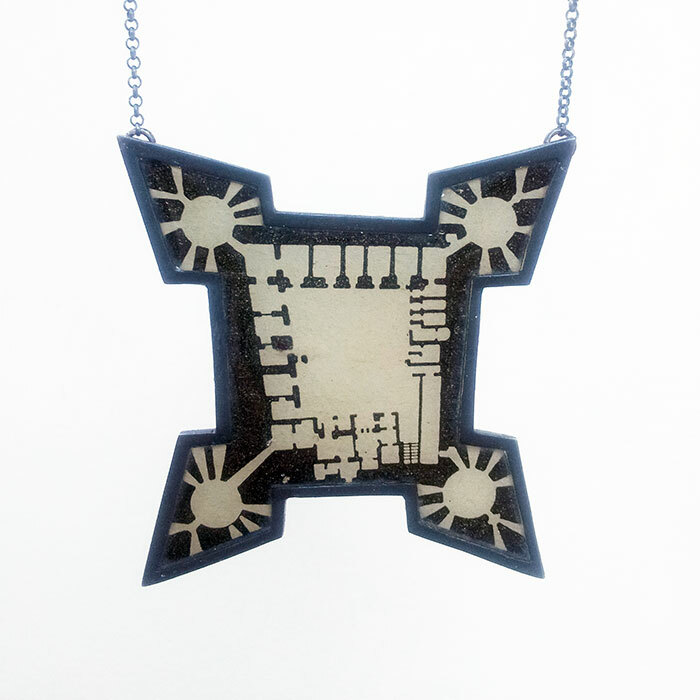 Once completely soldered, the backing piece can be trimmed or sawed flush to the same edges of the design, or left with a small border if desired. Do not sand or file any surfaces yet; this will be done later. If there is a curve or bend to your piece (such as a ring or domed pendant), it needs to be annealed and shaped before the stone inlay goes in. 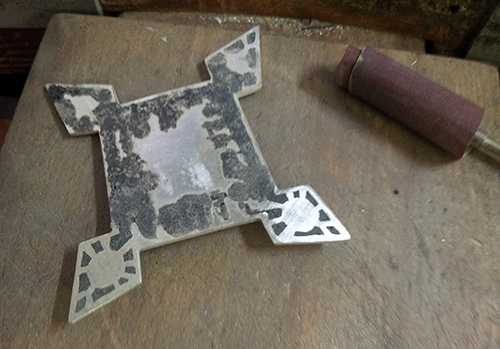 All heating, soldering, and shaping needs to be completed at this time, otherwise the stone inlay will burn out. Don’t forget to add any attachments now. Note: any curves to your piece should be convex and not hindered by other elements in order to allow you to file and sand down the stone inlay area. The stone chunk needs to be crushed. I use a metal hammer on a metal surface with a ring held around the stone so that it does not fly outwards when you strike it. Be sure to wear eye protection. The size of the pieces should be fairly small with some powder. Pour the pile of stone through a sieve onto a piece of paper, into 2 piles: one of larger chunks and one of powder. 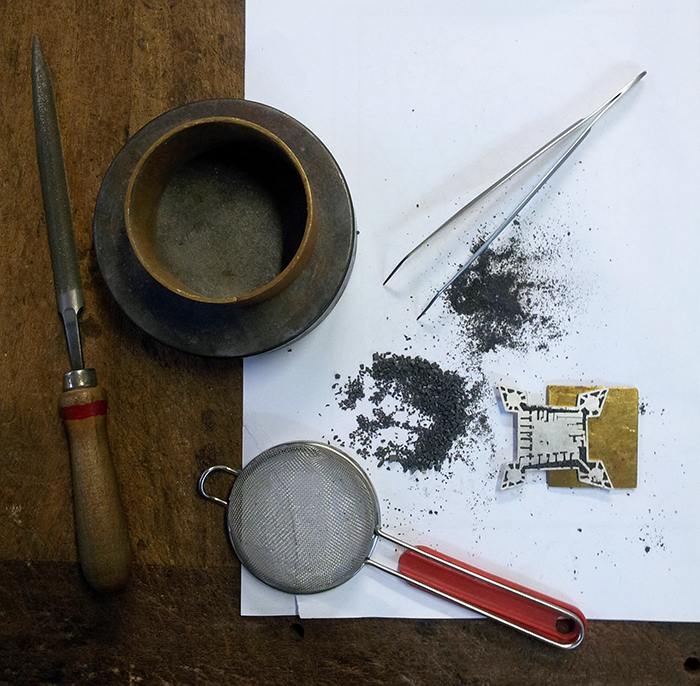 The surface of the spaces should be scored and scratched with a sharp tool to create a tooth for the stone to adhere. Begin to sprinkle in a thin layer of powder to cover the surface. This can be done with your fingers or tweezers. Carefully drop in some glue/epoxy, trying not to touch the powder or it will all stick to the glue tip. If the glue is liquid enough, it should spread naturally and get soaked into the powder. Be sure to wear a mask and do not hover over the fumes. Begin to place larger stones in the open areas, but try not to pile in too many chunks or you will later be filing down a mountain of stone. Fill in any gaps that remain up to the surface of the metal with more powder. Top off the stone with more glue, but try not to spill excess on the surface of the metal which will be difficult to remove later. Allow to completely dry. Once cured, the stone can be filed and sanded down to the surface of the metal. If any cavities appear, fill them in with more stone and glue, wait to dry, file and sand. Repeat until all gaps are filled and sand from rough 180 to fine 1000 sand paper. At this point, the piece can be polished as normal on a polishing wheel or gently tumbled. Note: sometimes small chunks come out at this step and may need to be filled in again.